On January 23rd, 2010 Dave got a text. His ex-girlfriend, who still had his dog in CA, could not keep her any longer and asked him if he could take her--if not, she would have to go to a shelter. OF COURSE he could not let that happen, SO, long and dramatic story cut short, on Feb 11th at 8pm we got in the car and drove through the night and until about 5pm the next day to arrive at his mom's house in Yorba Linda, CA. 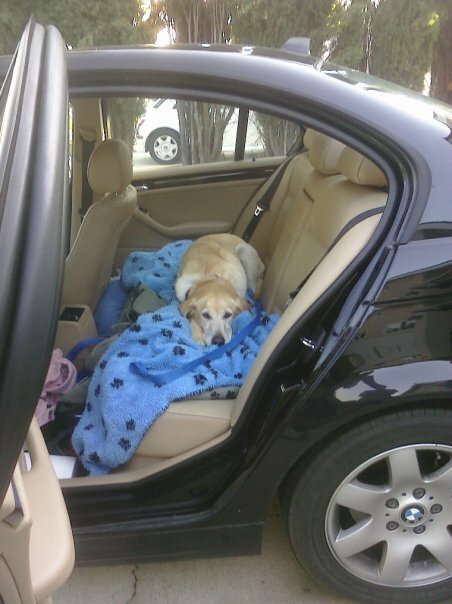 The next day, Dave went to pick up Shalan and brought her to his mom's house. 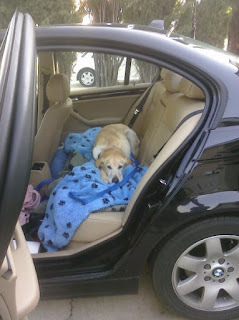 We bathed her and packed all of her things into the car and started driving....about 24hrs after we had arrived. We drove through the night, yet again, and arrived back home on Feb. 14th. Fast Fwd to March: Shalan goes to the vet for the normal stuff, shots, heartworm, etc. She needed her teeth cleaned, but because of her age, the vet wanted to do some bloodwork to make sure she was okay to go under. The night before I took her in to get bloodwork, Dave was petting her and noticed a lump in her throat. Neither one of us thought much of it, but he asked me to mention it anyway. The next day, we're at the vet and Shalan's being a ham, getting all of the tech's attention. I mention the lump to the vet and she feels it. Then she suggests that we go back into the back room. She tells me they want to get a sample and send it to the lab- it'll take a few days before they'll call us with the results. A few days later I'm at work and I get a phone call from Dave's mom- they called her because they couldn't get ahold of Dave or myself. Results are in- it's Thyroid Cancer. We take Shalan to Heart of Texas Veterinary Specialty Clinic and see a surgeon to have the lump removed. We are told from there she will have to have some chemo. We went through surgery and 4 rounds of chemo (one chemo every 3 weeks) with her and we are pleased to say that Shalan-dog is cancer free! Of course, every day I still check her neck! Chemo in humans has all kinds of nasty side-effects. Because of this, I specifically asked the vet what we should expect. Shalan never lost hair, she never had diarrhea or vomiting, but it did increase her thirst and her appetite. Weight-loss is common from chemo, as well, but not with my Shalan girl. She actually gained weight....and eventually we knew we'd have to help her take it off. Soon, Dave found a work-out buddy in our neighbor and started weight training with him...so it was just me and Shalan running....or rather, Shalan pulling me until I just couldn't take it any longer. Soon enough, Shalan and I were running 2 miles, twice a week. The fitness bug had bit. I started feeling better about myself- sleeping better, had more energy and soon enough I saw a shift in the scale. At the time it seemed like such a long road- getting started and disciplined was tough. But now it's part of my life. I have lost about 14lbs, I did the Turkey Trot on Thanksgiving and just recently completed my first 10k. I can't owe it all to running. I also began weight training. Dave started showing me things after we moved to the new house in Novemeber. Weight training is so important for women! It helps build not only muscle but bone as well! You're burning calories even after you stop actually lifting the weights and you will lose body fat! Click HERE for more benefits of weight training for women. I decided that 2011 would be a year for change and I'd say so far, so good! So that's what you were doing half of the day. Well done.